Definition at line 52 of file ScalarEvolutionAliasAnalysis.h. Definition at line 134 of file ScalarEvolutionAliasAnalysis.cpp. Definition at line 144 of file ScalarEvolutionAliasAnalysis.cpp. Definition at line 60 of file ScalarEvolutionAliasAnalysis.h. 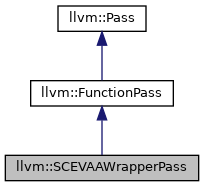 Definition at line 61 of file ScalarEvolutionAliasAnalysis.h. 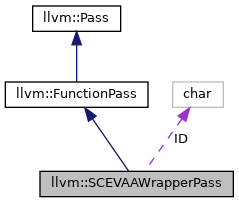 References llvm::createSCEVAAWrapperPass(), F(), and runOnFunction(). Definition at line 138 of file ScalarEvolutionAliasAnalysis.cpp. Definition at line 56 of file ScalarEvolutionAliasAnalysis.h.